Please note: The six course pdf files on the top table may be distributed freely. If you host them on your site please let us know. You can call us on Skype - chi.tec - or click below! Use a Chi-Card® - connected to your own Chi Generator® or a Chi Generator® in our labs, and make this structural link a wallpaper on your smartphone - This is the very best way to effectively counteract negative effects of electromagnetic frequencies coming from your cellphone AND from your environment (from phone towers, power lines, fluorescent lights, microwave ovens, etc.) as well as continuously supplying yourself with beneficial life force - orgone - chi energy !!! Something none of those "stickers" on your cell phone and/or other contraptions can do! 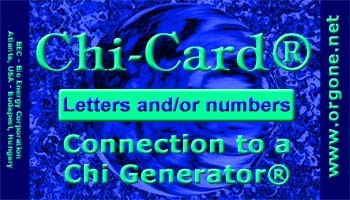 To establish a structural link from your Chi generator® or Chi-Card® to yourself, you can use the Chi-Card® design: Simply print out the blank Chi-Card® on the left twice. Then write some letters and/or numbers into the green rectangle and write the same thing into the rectangle of the second card. Instead of numbers and letters or your name, you can use a design, of course. Important is that whatever you are using, it should be individual, or unique. To test for transfer: put one of these chi cards next to your Chi generator® and put the second one on a flat surface, then proceed as in the transfer tests, i.e., holding the palm of your hand above it. Naturally you can make your own Chi-Card, with a background that you design, etc. This card is here to make things easier for you and/or to give you an example of how you can make your own. which are your own, of course! to turn your deepest desires into reality with ease. Click Here for info and Broadcast Schedules. are registered trademarks owned by Karl Hans Welz.